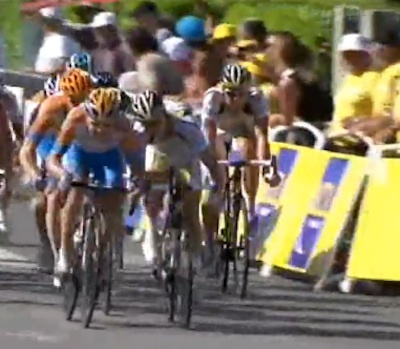 In todays’ sprinters stage at the Tour, Mark Renshaw was removed from the race after headbutting Julian Dean. That lit up Twitter like the fight earlier in the race and Lance’s pedal-clipping, tire-rolling crash. We’ve been discussing it most of the day on Twitter and Facebook. I asked Local Pro and sprinter Russell Stevenson to explain what’s going on. I think there’s a long history here and expect that a Lou Pinella-style explosion came at the officials from the Team managers when they saw it happen. Earlier in the year, Cavs was relegated at the Tour de Suisse and the riders protested him the next day. There is a code amongst this guys yes and today we saw that get broken. I’ve raced a handful of times with Tyler, when he was coming up, and he’s a straight up dude. You can see in this video how shaken he is. “Julian came hard in on my position with his elbows. I needed to use my head to retain balance or there would have been a crash. If had used my elbows when Julian brought his elbow on top of mine we would also have crashed. The object was to hold my line and stay upright. Headbutts are 1.) not legal…unless not seen. 2.) to be used only on someone who is capable of firing one back at you. 3)supposed to be subtle. You can see it at 5:47 in this video.